Our range of Shelving is delivered flat packed so this means that small orders will be delivered by parcel carrier and for larger orders delivery will be on a pallet delivery. 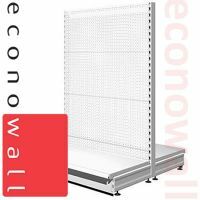 If you are ordering your metal shop shelving at the same time as larger items that require pallet delivery, then to save you money, we will include them on that delivery for you rather than charge you for a seperate delivery. To Find out how much delivery cost will be please add all the items you require to the shopping basket, click on view basket and you can easily calculate your personal delivery cost from there.